I’ve developed a new habit. I get out of bed between 6 and 6:30 in the a.m. (which, if you knew me, would stun you, lol), i fix a cup of fake coffee, and i work on glass for an hour. In my pajamas. 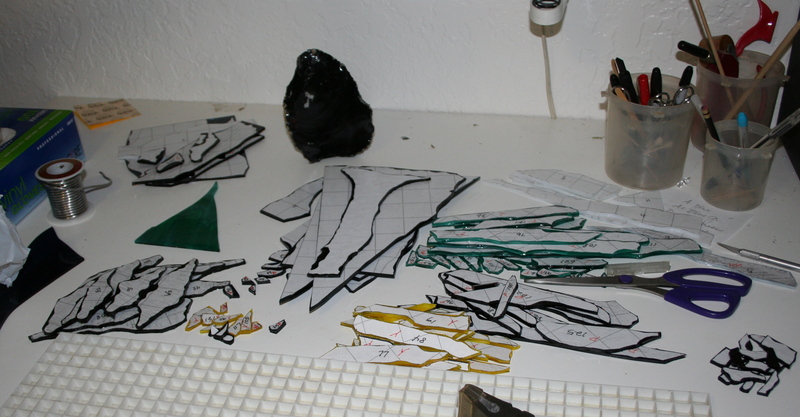 the total height of decadence, working on glass in my pjs. I have a little less than 6 weeks to Artwalk. I have joined the Association, paid my fees, and sent in the application. I still need to figure out how i am going to display the art, but that is for another day. I finished one fish windsock. the place i had purchased the large glass beads for the lures from, in the past, had crap for selectioin. and two of the 5 beads i did buy weren’t drilled all the way through and i couldn’t get them on the wire. very frustrating. if anyone has a suggestion on where i can get large, clunky glass beads in cool colors (the size of a fat green grape or thereabouts), please send me an email. maybe i should check etsy. not quite finished. need to find those glass beads. i am super happy with teh color scheme on this one. 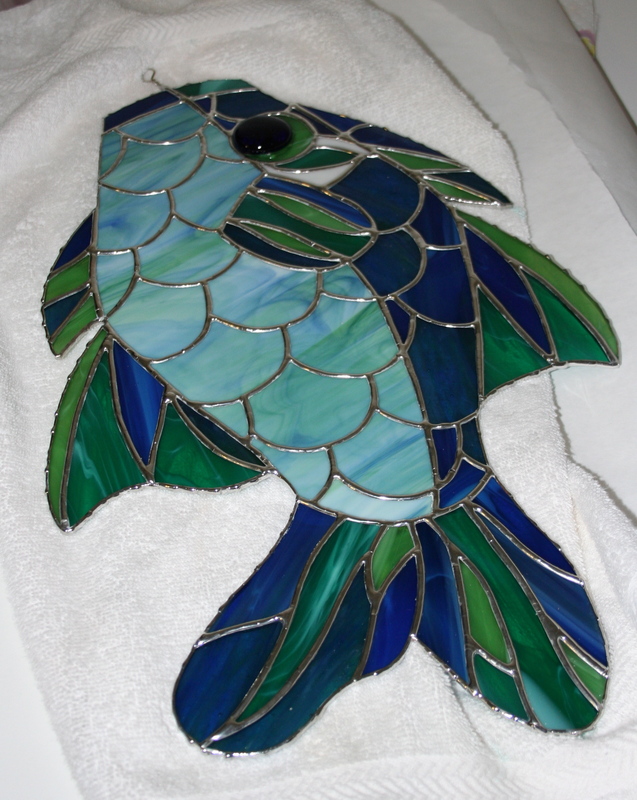 i was planning on making a second one, with a neato glass i have that is a red/orange/yellow/white. but something in me says not to use that glass for a fish. to keep the fish in the cool tones. i have anotehr piece of glass that is delicately mottled, mainly teal, but with some streaks of white, yellow and pink in it. if i have time, i will probably do that. have begun work on northern light v2. enlarged the pattern, expanded it. the overall size is up form 9×30 to 13×36. it doesn’t sound like much, but the iimage looks considerabley larger. i moved the tree off-center, added some mountains and extended the lights. it’s pretty awesome. i might have to sell the smaller one and keep the larger one. or redo it completely for myself if i sell it at the Artwalk. Have quite a few pieces in the pipeline too. picked up a xmas piece, to add to my long overdue gift for my cousin. i think that is all i am going to take for xmas. its only 7 weeks between the artwalk and xmas day… i have no idea how i am going to be feeling, emotionally, this year, with it being the first without my mom. probably a good idea to not create too many stressors. beginning the first of the year, i will be working on a commission piece for an old friend. Two large windows for her house, one a sea life, the other a floral. oh, and the owner of the turtle has decided that it needs a companion piece, which will be a duplicate of the breaching humpback, summer fling, hawaiian fling. i forget what i called it. so. lots on the to do list. and there is the county fair to consider. making apiece for that and entering it. and next years ArtWalk. ~ by kellig on September 21, 2011.